Sareen and Associates is one of New Clients Inc.’s most prolific clients. 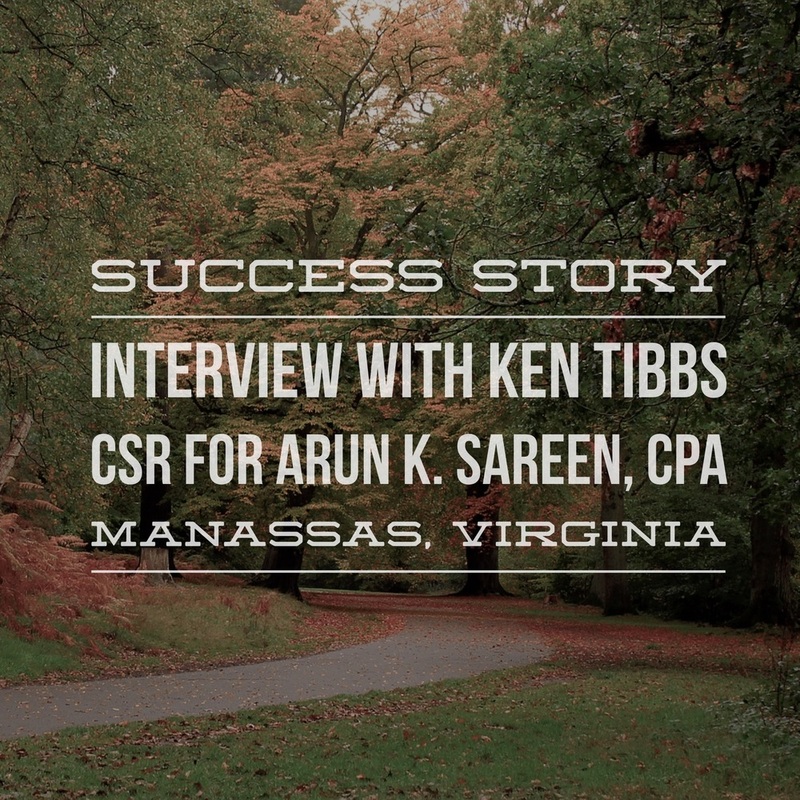 Arun Sareen came to NCI in 1993 looking to buy an accounting practice. Prior to this he had been a chief financial officer for a cable company in the British West Indies. NCI didn’t have any listings in his area so Arun looked into our marketing programs and undertook a Plan 2 Client Acquisition Program. From there he has grown his start-up business to over 4.5 million dollars in gross billings and he has multiple office locations in Virginia and Florida. He also employs multiple Client Service Representatives trained by NCI. One such salesperson is Ken Tibbs. Ken and Arun go way back and he has been with the company selling since very early on. I spoke with Ken about his many decades of sales experience and what life has been like for him selling accounting services. He gives some great insight into the sales process so make sure you Plan 2 clients have your CSR’s give this a read. Chris: Can you give me some background on yourself prior to working for Arun as a CSR? Ken: Well, I’ve been in sales pretty much all my life. I was in automobile sales for twenty some odd years and before I just started selling the accounting, I was working for Arun at managing a convenience store and a restaurant. Chris: How did you go from doing that to working in sales for Arun? Ken: Well he knew that I had been in sales, to start with. So he actually sold the restaurant and convenience store and he moved to the islands. Then I went back to work selling cars. Then he came back to the U.S. and I went back to work for Sareen and Associates. Chris: So Arun came back to the United States and started his accounting practice, needed a salesperson and he contacted you? Ken: Right, but I came in first doing the appointment setting. When I first came back to the office we had in Fairfax , I did a little appointment setting, making my own appointments and then selling them. Chris: How did you benefit from the NCI program? Ken: I just hit the street running, and I listened to all the data you gave. The videos, I studied all that, all the written materials all those things and I just took all the information and applied it to my know how and just took off running. It was pretty much [what I was used to] except I didn’t have a product that you could test drive, taste or try on. Chris: Right, you’re selling an intangible product now. Can you tell me a little more about how you benefited from the NCI training materials? Ken: Well, it gave me some insight on accounting, you know accounting was just a word until I started reviewing these things and picking up some of the lingo that people react to, certain words that I never had to deal with in terms of selling. Along with that, studying the contract that you have, offering the client unlimited consultation and all those things that go along with the program. Chris: How long have you been a sales rep. with Sareen and Associates? Ken: I’m coming into my 18th year selling accounting. Chris: What’s a typical day on the job like for you, Ken? Ken: Usually I go in and my appointment setters have already set several appointments for me that day. The day before I call the people to verify the appointment or confirm and then I call again right before I take off [for the appointment.] So that’s how my day usually starts off, if I have an early morning appointment I go off, if not, then I go into the office and work the phones. Of course along with that, I have a large number of clients in my book that I have to service. But I still work the phone all the time. Calling people, I talk to a certain amount of my clients on a regular basis. Some people I’ve had for fourteen, fifteen years. They call me if they have a problem but especially if I have new clients, new sign ups, I’m always calling them, talking to them making sure everything is okay because the first three months is the hardest time with a new sign up. Chris: Sure, you have to get the client trained properly, as Duane Gravley says. Ken: You have to get them acclimated to the system because they’ve been doing things a certain way. And we’re asking them to change their lives when it comes right down to it. Chris: Absolutely, it’s key in the beginning, getting the client established or you’re going to have some problems down the road. Ken: That’s it. And nobody gives you everything you need. It’s a step process. The first time you go, you give them the back checklist [ provided with NCI 's Advanced Processing Program] They put that together, but it usually takes two or three trips to get a new client up to speed. Chris: What do you find to be the most rewarding aspect of being a CSR? Ken: Seeing the satisfaction from the client, who has been doing things a certain way, he’s way behind in taxes and when all of that is smoothed out, he is so full of gratitude that he tells someone else and they tell someone else. But, just that feeling that you helped somebody. Chris: And what would you say is the most challenging part of the job for you? Ken: The most challenging [part for me] well some clients, they didn’t get in this [bad] position overnight and [Arun] can’t fix it over night. Just getting them to understand that sometimes it takes time, you know? Chris: Can you offer some advice to new CSR’s who may be reading this? Ken: For a new person, if you have not done this kind of sales before, people tend to take this personal. You have to accept rejection in this type of work and it’s not rejection of you, because they don’t know you. A new person just has to give it time. You’ve got to build that client relationship and when you first start out, money is slow but you just have to keep working at it. Once you get 25-30 clients built up you begin to see some daylight. Chris: Being in sales you certainly have to be thick skinned and persistent. Once you get established though it’s very much worth it. Ken: Yeah, sometimes folks don’t realize this. The money in this is a residual. You get yourself fifty or one hundred clients and say your average is a 500 a month client and you’re getting a percentage of [the monthly fees] for each one. It doesn’t take long, when you add your five, six sales a month and you have a good living. Chris: Speaking of which, how many clients, roughly, have you signed on for Sareen and Associates? Ken: I service about a hundred and twenty now. I also have a lot of clients [that I signed up] who I don’t service. Some of them go electronic. How many clients do I have on the books since I started? Probably about twice that number. Chris: So about 240-250 clients? Ken: Yeah somewhere around there. And businesses grow, we believe in small to medium size [businesses] and people outgrow us. When they have a tremendous big business they need their accounting in house. Chris: Do you have any advice for a more seasoned CSR? Ken: Well I don’t know if a lot of salespeople are getting into this or not, but a lot of us are not computer savvy. Now we need to be more aware of the QuickBooks era that’s come about. Our clients are changing. When I started people were writing on a rock with a hammer and chisel (laughs) but now people are moving into a new century and they’re using QuickBooks and they ask you questions. I’m not saying we have to know everything but we have to be able to still sell the sizzle and not the steak. That’s what I see now, we have to get just a little more savvy on the computer side of it. Chris: A good point, you have to know computers in this day and age. You hardly encounter a business anymore that doesn’t use computers in some way shape or form. Ken: Exactly, and the first thing a prospective client wants to do is turn it around on you and ask, ‘what am I doing wrong?’ You have to be prepared to sidestep that and get it to the [accountant] but if you don’t show that you know something, you’re not going to get that chance. Chris: How has your quality of life changed since becoming a CSR? Ken: Well I’ve come a long way, life is really good. I’m making a good salary, and what I love about this job is that I’ve met so many good people on this job, people that became clients and friends. It’s very rewarding, I love what I do. Chris: That’s so important to having success in your field. You have to have a passion for it. What is your relationship like with Arun Sareen? Ken: We’re as much friends as we are co-workers. We work together, we go on a lot of appointments together. We have a really good relationship. Chris: Does Arun still hold regular meetings with the sales team as NCI advises? Ken: We actually have a sales meeting today. Chris: How often do you have these meetings? Ken: Usually three to four times a month, but he’s available to go with us on appointments if need be and to run things by. If I’m out in the field I can call him on the phone, he’ll talk to the client. He’s a great help. Chris: That’s great, that can make all the difference with a successful program. The accountant has to be willing to get in there and work with the sales team.